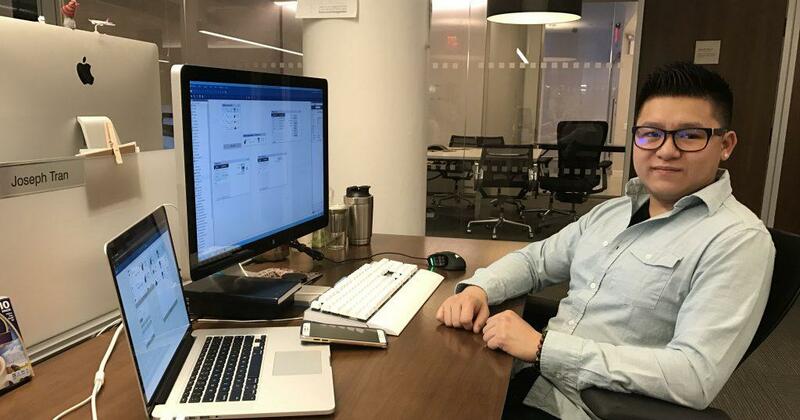 How does a first-generation millennial from Brooklyn end up as a business software engineer at Infor? Easy—you teach him how. At least, that’s what happened for me. I wasn’t planning to be a software developer, but the opportunity to learn came to me after being introduced to the Infor Education Alliance Program (EAP) during my time at CUNY’s New York City College of Technology (City Tech). The Infor EAP is a relatively new and, in my case, life-changing opportunity. As our CEO Charles Phillips shared in Crain’s Business last month, when Infor moved to New York City in 2012, finding college graduates with relevant skills was a challenge. He figured out there was a mental block since many students mistakenly think of technology as just smartphones, web design, and social media. To help educate people about other tech opportunities, specifically those in enterprise technology, Phillips decided to develop his own talent pipeline for Infor and its customers by creating the Infor EAP in 2014. Since then, through partnering with educational institutions like City Tech, the EAP program has helped meet the rising demand for new technology talent, providing students all over the world with access to an experiential environment working with Infor software to better prepare them for a tech-focused future. To date, EAP has touched more than 2,000 college students and has placed approximately 200 (including me) in jobs at Infor, and with our partners and customers. I am proof that it works! My experience through the EAP while a student (in conjunction with a little hard work and dedication) has led to my career at Infor. My senior year, I was one internship short of graduating, so my advisor suggested a special course that would count as an internship, “Implementing ERP Business Software,” a hands-on, noncredit, 3-month, tuition-free course sponsored by Infor. Through the course, I got to work on Mongoose, Infor’s application development framework, and when I completed the course, I was offered a paid part-time internship at Infor (called Scholars), working on Infor Mongoose to write new software. Today, I am a full-time Infor software engineer, working on the Mongoose Enablement Team building ERP applications. As one of the team’s first EAP hires, I felt well prepared to execute Infor technology, and am being encouraged by my team to work toward becoming a full stack developer. To date, 13 students have gone through the Mongoose program and 5 are now full-time team members. In my opinion, this is the best way to nurture and promote new talent, and solidify our future resource needs. Because of my experience as an EAP student and Infor Scholar, I was in a unique position to give back during this year’s Inforum (Infor’s flagship customer conference), supervising an on-site hackathon at which high school students were tasked with creating widgets using Infor Mongoose. Working with these students who had no technical background and teaching them the framework and how to build intricate, responsive, working forms in just three weeks has been one of the more rewarding experiences of my life. It’s a full-circle example of Phillips’ vision to create an ecosystem where Infor teaches the teachers to empower the next generation of technologists. The Infor Education Alliance Program not only prepared me with the practical skills necessary for my role as a developer, it also taught me the critical thinking and interpersonal skills I would need to be successful in a professional environment. Most importantly, the skills I learned through my course work and internship allowed me to walk into Infor prepared and confident in both my skills and my knowledge of the products. The private/public partnership model for building a talent pipeline has been life changing for me as well as many of my peers. In our competitive world, students need career development in addition to academic development. The EAP is one way Infor is helping fill that need. I say this is a great model for shrinking the STEM skills gap.